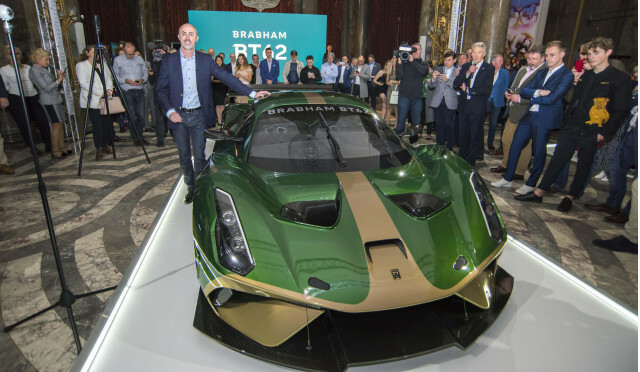 Brabham will use this week’s 2019 Autosport International show starting Thursday in the United Kingdom to formally announce plans to take the BT62 supercar racing in the World Endurance Championship, whose highlight is the 24 Hours of Le Mans. The Australian race team and nascent car manufacturer said Wednesday that it’s committed to entering the WEC as a factory team in the GTE class for production-based cars and has already started the development work. This is the same class where Ford races its GT, Ferrari the 488, and Porsche the 911. The aim is to have the team and BT62-based race car ready in time for the 2021/2022 season. To get BT62 owners involved in the race program, Brabham has established a driver development program where owners can help test the BT62 and provide feedback for the race car’s development. Brabham said there might also be an opportunity for private teams to enter the BT62 in WEC’s GTE Am class. The company is also investigating lower level series, so don’t be surprised if a GT4 program is announced at a later date. Overseeing the race program is Brabham Managing Director David Brabham, son of Brabham co-founder and Formula 1 legend Jack Brabham. David Brabham is an ex-F1 driver himself and a 24 Hours of Le Mans winner with Peugeot, so he’s a natural fit for the team.